Become even more enthralled into the subtank vaping world, with Kangertech’s new subox mini starter kit vape mod box. It now comes available in two colors. White and black as well as red and black, both using a ceramic coating instead of paint allowing for less chipping and long lasting glorious color. The Kbox vape mod box has gone through some serious upgrades, upgrades that will enhance your vaping experience. 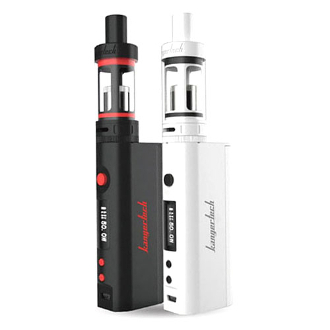 The kit will come with a 50 watt kbox, giving you the option to go as low as .3 ohms for a high intensity of vaping. The Kbox vape mod box 50 watt now allows for two ways to charge your 18650 sized batteries. You can either charge your battery in a lithium bay charger, or you can charge it through its new pass-through! This is fantastic and much easier for us vapors out there, as this gives us the availability to have a constant full battery life and for us to be able to charge and smoke our e-cigarette at the same time. Keeping Kangertech’s revolutionary design, the kit will come with their subtank mini clearomizer, allowing you to use both occ and rba coils to keep you vaping your favorite flavors and clouds for days. The options are endless with this style… subohm vape with a simple flick of the wrist to screw on a premade subohm coil or show off your sweet rebuilding talent and your cotton fluffing skills. Just like most 510 threaded batteries, the Kbox mod box has a 5 on/ 5 off future, allowing you to safely store your box mod. After you click the button five times to turn it on, the words “Kanger Tech” will pop up on your Lcd Screen. The Lcd screen will display information such as: Battery level, Ohm reading, and output wattage. To change wattage output, simply press the “+” and “-“sign. The Kbox has a lot of new protection features on it as well. The Lcd screen will let you know when there is a short circuit and will read as “0.0Ω”. When your Box mod starts running hot, your Kbox’s temperature protection will stop battery function and your Lcd screen will read as “Temp High”. If you forgot your basic safety rules and don’t turn off your batteries when not in use… do not worry as there is a safety future just for you. The Kbox will automatically stop battery function after 10 seconds of your button being continuously pressed and your Lcd screen will read as “10S OVER”. **Due to the high tech nature of this product there is no warranty, returns or exchanges. This product is for experienced users and requires technical vaping knowledge in order to properly use it. Never leave your batteries unattended while charging.